A version of this story aired on the Texas Standard, a public radio collaboration led by KUT in Austin, Texas. Here’s a link to a panel discussion on NPR member station KPBS, San Diego analyzing the results. CHIHUAHUA, Mexico — Midterm elections in Mexico, as in the United States, are a referendum on a president’s performance. On Sunday, Mexicans will elect an entirely new congress along with 17 state legislatures and a host of governors and hundreds of mayors. The results will set the tenor for President Enrique Peña Nieto’s final three years in office. President Enrique Peña Nieto greets citizens, Ojinaga, Chihuahua, Nov 28, 2013. His mandate will be strengthened or diminished in Mexico’s midterm elections and there are implications in the results for both Mexico and the United States. Congressional representatives in the lower Chamber of Deputies are limited to a three-year term. Senators serve a single six-year term, as does the Mexican president. The new congress will support, or stall, the second half of Peña Nieto’s term. And the election outcome has implications for United States-Mexico relations. After a 12-year absence, Peña Nieto led his PRI party back to Los Pinos, Mexico’s White House, three years ago pledging to change the national conversation. Eighteen months ago, Peña Nieto was hyping economic and political reform. Mexicans loved the message. He had arrested the corrupt head of the politically powerful teachers union and he was crafting energy and telecommunications reform in an unprecedented attack against state and private monopolies. And he said he would confront corruption. But today, opposition election ads focus on one theme. “Zero tolerance for corrupt politicians,” an opposition party’s radio ad exclaims. 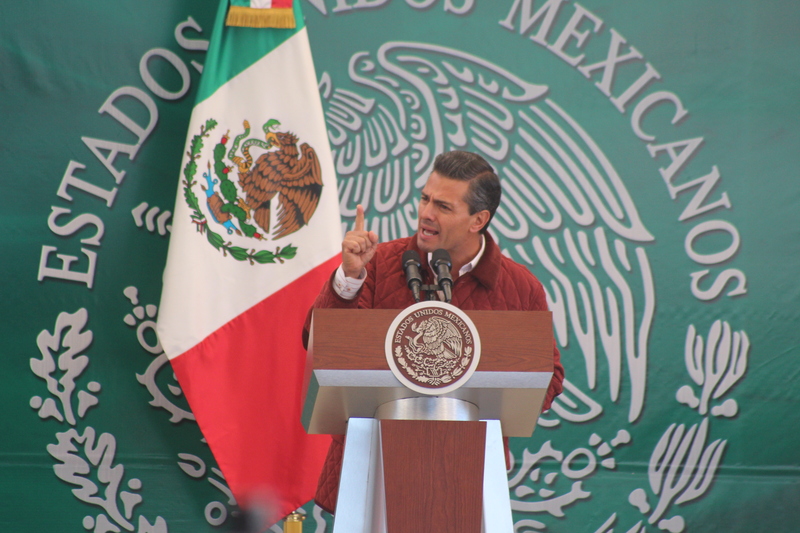 It castigates Peña Nieto, saying his anti-corruption rhetoric is hollow and cosmetic. His presidency has been tarnished in the past year by violence and evidence of continuing corruption. Last September, in the most shocking incident, 43 students were taken off buses in a small town in southern Mexico and murdered, allegedly on orders from an elected mayor. The mayor allegedly ordered his local police to hand the students over to assassins who may have been told the students were members of a rival cartel. Peña Nieto was widely criticized for a slow and inept response to the crisis triggered by those murders. The slaughter was and is still seen as a symbol of the historical nexus between government and organized crime inside Mexico. And in May the government was again on the defensive after a shootout that left that 42 purported cartel members and one policeman dead. He’s a retired political science professor. He said Peña Nieto’s predecessor Felipe Calderón also wanted change that ended in violence. Calderón thought he would stabilize Mexico by confronting organized crime. It didn’t work. Now, Acosta said the biggest obstacle facing all parties isn’t disdain, it’s apathy. That’s also because in the last three years, there have been a series of allegations of corruption raised against every party. “I don’t trust them, they’re all the same,” he said of politicians in general. His worst fear, he said, is that nothing will change and that violence and corruption will continue to scar Mexico. There’s currently a movement to annul or destroy votes by leaving ballots unchecked. Activists have blocked roads urging drivers to annul their votes to signal dissatisfaction. “Our vote is the most important weapon that we have to change this situation,” he said. Turnout in midterm elections in Mexico is notoriously low and this time around may be even more so. National polls suggest flagging support for Peña Nieto. Selee is a Mexico and Latin America specialist at the Woodrow Wilson International Center for Scholars in Washington, D.C. He said there are fundamental questions the U.S. hopes are answered on Sunday. “Is Peña Nieto going to come out of this election strengthened? Is he going to come out being seen as a leader who has a mandate, who has control of congress, in which case he’s in a very strong position to look at some of the international issues including issues of economic opening with the United States, issues with migrants in the United States and lot of things that have to do with our country,” Selee said. There are other issues of importance to the U.S. For one, American energy companies are also monitoring this election campaign. They’re eager to enter Mexico’s domestic energy sector. Peña Nieto helped change Mexico’s constitution to allow foreign companies in. He overcame the opposition of Mexican nationalists who maintain that outsiders have no place in Mexico’s energy market. If the Mexican president is rebuked at the polls, some of those companies will undoubtedly revisit and refine their plans for their prospective operations in Mexico. This entry was posted in fronteras desk and tagged Mexico, Mexico Congress, Mexico Drug War, ojinaga, pen, pena nieto. Bookmark the permalink.